This is the classical accompaniment of the famous cochinita pibil , that consists of red onion accompanied with chili, bathed in orange juice and seasoned with salt and pepper. This combination is sensational because it gathers spicy, sweet, sour, bitter and fresh – all in one bite. Impossible to resist them! This salsa is specialized in accompanying the cochinita pibil, a pork meat dish typical of the cuisine of the state of Yucatan. But they happen to be so tasty that you can also use them to accompany any of your favorite tortas. The recipe is not complicated to make, it just requires some patience while working with the onion. This recipe could be prepared with white onion but it will lose some sweetness and hotness in the end result, besides the visual effect that the tender purple color delivers. In this recipe bitter orange is used, if you don’t find it don’t worry as it can be substituted for 1/3 of a cup of white vinegar with 1/3 of a cup of lime juice. The result will be very similar. The preparation requires of about 25 minutes and then the onion has to be left resting for 2 hours. 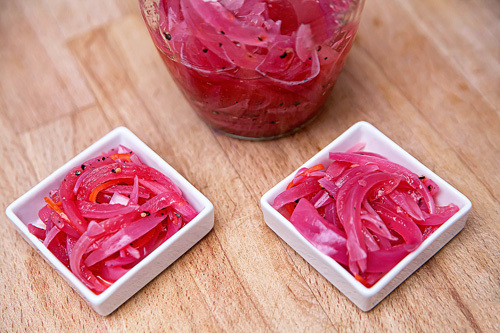 Cut 1 red onion into strips, then reserve. Pour in a saucepan the enough amount of water to cover all the red onion strips that were cut and bring it to a boil over high heat. When it boils turn off the heat and incorporate in the saucepan the red onion strips that were cut. Cover the saucepan and leave dephlegmating the red onion strips in the hot water for about 10 minutes, until its flavor softens. Transfer from the saucepan to a colander, the red onion strips that were dephlegmated and rinse them. Transfer from the colander to some paper towels, the red onion strips that were rinsed and dry them. Then set aside. This dephlegmating onion process is done to attenuate the flavor and the smell of the onion. Remember that it is a side dish and it cannot overshadow the main course. Remove the seeds and the veins of 1/2 habanero pepper. In this way the habanero pepper won’t be that spicy and you will get a moderately spicy salsa. Finely chop the habanero pepper with the one you worked and put it in a bowl. The Red Onion slices that were dried. The juice of 3 Bitter Oranges. Mix very well the bowl ingredients with a mixing spatula. Leave the red onion for pibil resting for 2 hours, so the flavors combine. The onions can also be left resting in the refrigerator. Only cover the bowl with a piece of food wrap film so the onion won’t dry. Tip: If you leave the red onion for pibil resting 1 day in the refrigerator – the flavor that is generated is indescribable. Recommendation: Try these onions with some tasty tacos al pastor. Did you like the Onion for Pibil? These habanero peppers have a divine color, a fruity taste and an enormous hotness. Mix the ingredients in a bowl with silicone base so it doesn’t slip. If you need a colander this one is stable, it has a good grip, is easy to wash and lots of food fits in.